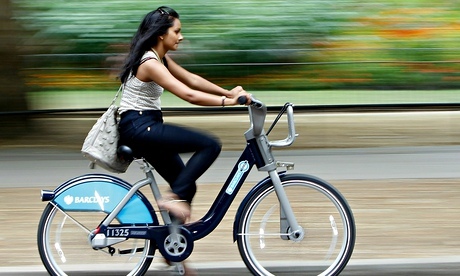 So-called Boris bikes provide a health benefit to cyclists that outweighs the hazards of riding them, a study has found. The positive effects of the London cycle-hire scheme are greatest for older users, the research shows. Scientists balanced improvements to health from the physical activity of cycling with the potentially harmful effects of physical injury and inhaling traffic fumes. The results showed that the benefits far outweighed the negatives, at least when assessing injury rates for people riding Boris bikes. A slightly different picture emerged when injury rates for all cycling in London were taken into account. Then, the net gains from hiring bikes reduced – and disappeared altogether for women. The London cycle hire scheme, sponsored by Barclays bank, was introduced in 2010 and championed by the city's mayor, Boris Johnson. His enthusiasm was such that the bicycles soon came to be known as "Boris bikes". Dr Anna Goodman, from the London School of Hygiene and Tropical Medicine, said: "When the cycle hire scheme was introduced, there were widespread concerns that increasing the number of inexperienced cyclists in central London would lead to higher injury rates. "Our findings are reassuring, as we found no evidence of this. On the contrary, our findings suggest that the scheme has benefited the health of Londoners and that cycle hire users are certainly not at higher risk than other cyclists." Currently around 10,000 Boris bikes are available across 723 docking stations covering a large amount of greater London. During the year the research was carried out, between April 2011 and March 2012, more than half a million users made 7.4 million trips on the rented bikes. The study authors determined health benefits using a disability adjusted life years, the number of years lost to life through illness, disability and premature death. The research, published in the British Medical Journal, showed that riding Boris bikes led to a significant increase in healthy living in men and a smaller gain for women. Co-author Dr James Woodcock, from the Medical Research Council epidemiology unit at Cambridge University, pointed out that the health benefit of Boris bikes was lower in younger adults, who make up the majority of riders. "One reason for this is that many of the diseases affected by physical activity, such as heart disease, are less common in younger people," he said. "Even though older adults might be more at risk of injury than younger adults, the benefits from being active increase much more quickly. "Reducing road traffic danger is another key factor. If cycling in central London was as safe as in cities in the Netherlands, the health benefits from initiatives like the cycle hire scheme would be far more substantial. "The Netherlands manages to achieve high levels of cycling with low risks, not by focusing on helmets and hi-vis, but by providing high quality infrastructure that physically protects cyclists from busy, fast moving traffic." Lack of exercise has been linked to a wide range of health problems including heart disease, stroke, diabetes, dementia, depression and cancer. Cycling is said to provide a good way of incorporating physical activity into everyday life. Dr Janet Valentine, head of public health and ageing at the MRC, said: "The health benefits of regular exercise are undisputed. It is important that we conduct rigorous scientific studies to assess the wider impacts of interventions designed to promote health. "Studies like this, which look at large amounts of data from real-world scenarios, will help to develop future strategies to bring about positive changes to our health."